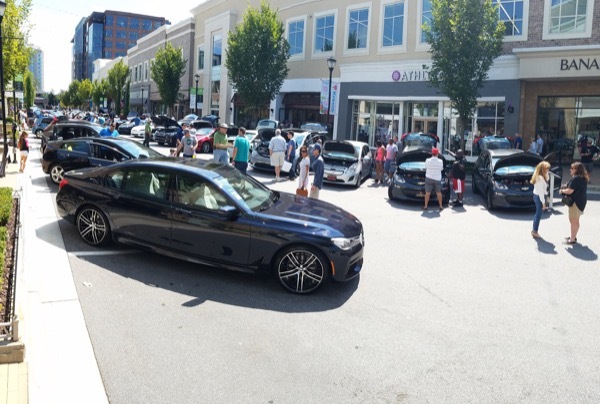 We had such a fun time at our metro Atlanta National Drive Electric Week celebration at Avalon in Alpharetta. Some 40 EVs were displayed and Nissan pulled out all the stops with an interactive 2018 Nissan LEAF display. What an awesome car!! United BMW and Chevrolet also offered ride & drives to attendees. Chevy, with only one Bolt ( they were disappointed they didn't bring more!) gave at least 40 drives and BMW, around 25. Check out more images from the Electrify the South Facebook page and the EV Club of the South group page. NEWS FLASH! Nissan will exhibit the all new 2018 LEAF at Drive Electric Week Alpharetta Avalon - Be among the first to see second generation Nissan LEAF! The 2017 metro Atlanta National Drive Electric Week returns to Alpharetta Avalon GA 400 Exit 10! The event will be held on Saturday September 9, 2017 and will be open to the public between the hours of 11:00 AM and 4:00 PM. The Electric Vehicle display will take place on Avalon Boulevard between the Valet Circle and the Tesla store, as it was in 2016. Returning sponsors this year include: Georgia Power (Presenting Sponsor), United BMW (Major Sponsor), ChargePoint and Hannah Solar (Supporting Sponsors). Sponsors will have table/exhibit space on the Avalon Green. CleanCities Georgia, EV Club of the South and Southern Alliance for Clean Energy will also exhibit on the Avalon Green. A Ride & Drive is available by registering at the Event Registration table with vehicles provided by United BMW. EV owners who display their vehicles will be provided with breakfast (Goldeberg's Deli) and lunch vouchers (Farm to Ladle). Mark your calendars for Saturday September 9th and register by clicking the blue button at the top of this page to bring out your electric ride and enjoy the day with fellow EV owners and future owners! There are currently 265 attendees registered. Registered attendees report 1,652,795 electric miles driven.